Kate White has been a freelance writer and editor since 2005. Her work has appeared in both U.S. and U.K publications. White also writes extensively for the Internet and is published on websites such as About.com. When you knit or crochet a swimsuit you require yarn that holds its shape and is colorfast. Many people crochet and knit swimsuits as stylish wear for sunbathing, however if your intention is to swim in your swimsuit, you will need to ensure that the yarn does not stretch or shrink when it is wet. Yarn used to make swimwear is subject to harsh conditions. The combination of full sunlight, salt from the sea or chemicals from a pool and suntan lotion can result in a the yarn fading or leaching color and shrinking or stretching. Wet yarn will also be extremely heavy and this will alter the fit of the swimwear. Thick or heavyweight yarn will be bulky and uncomfortable to wear. Crochet cotton is a good yarn for knitting and crocheting swimwear and is available in many colors. Yarn suitable for swimwear is available from both local and online yarn stores. Online yarn stores are likely to offer a great range of yarns, both in color and weight. However you will not have the opportunity to see and touch the yarn prior to buying. Local yarn stores will be able to provide you with help and advice about your purchase. Yarn manufacturers' websites are also a good place to buy yarn. Companies such as DMC offer a comprehensive range of crochet cotton which is ideal for making swimwear. The cost of the yarn will depend on how much yarn you buy. It is often more economical to buy larger balls of yarn and this is a good option if you are planning on making several swimsuits. Good quality crochet cotton has a retail price of between $2 and $4 an ounce, however significant savings can be found when buying in bulk. Crochet cotton, with the wide range of colors and weights, is an ideal yarn for making swimwear. Other yarn types, also offer significant benefits. Man-made yarns, such as acrylic, are strong and extremely color-fast, making this an appropriate option for swimwear that is to be used for sunbathing. One of the drawbacks of acrylic yarn is that many people don't like wearing man-made yarns and fabrics next to the skin. 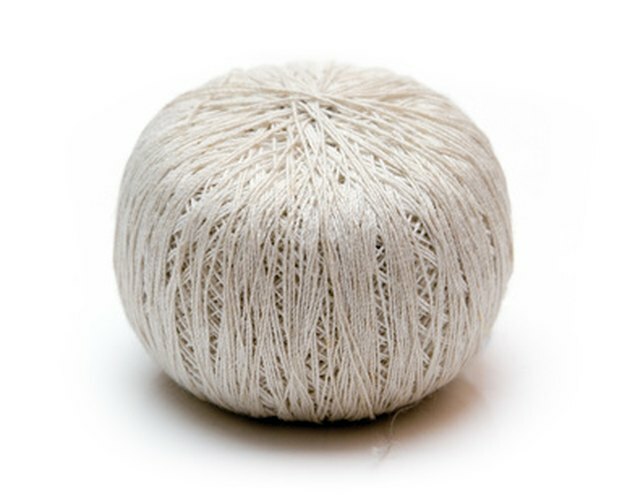 Modern "eco" yarns, such as yarn made from bamboo-derived rayon, soy silk or milk protein, are alternatives if you are looking for natural yarns. These are more expensive, than crochet cotton and are not as readily available. There are many other beach and swimwear items you can make to complement a handmade swimsuit. This includes a sarong or wrap, beach bag or stylish top to wear over a swimsuit. Small items such as crocheted flowers or beads make trendy beach accessories. These are a crafty way to use up odds and ends of yarn left from other projects. Consider lining swimming suits. This will help to ensure that the swimsuit keeps its shape--and preserves its wearer's modesty. Make a sample square before knitting or crocheting the pattern. Wash and dry the sample several times and check for shrinkage or stretch. Make any necessary adjustments to the pattern before starting. Buy enough yarn to complete the project. The dye lots can vary, which could result in yarn from two different dye lots being slightly different shades.